Thorhallur Halldorsson says, “There aren’t many prenatal dietary or environmental factors identified that explain growth in children (but) milk drinking may be one.” Halldorsson, a research scientist at Denmark’s Center for Fetal Programming at the State Serum Institute in Copenhagen, is part of an international team of medical scientists who tracked mothers and their children for 20 years to determine if milk consumption during pregnancy influenced each child’s growth potential. The September 4, 2013, issue of the European Journal of Clinical Nutrition carries the findings of the study. Halldorsson’s research team followed the pregnancies of 685 Danish mothers, including documenting how much milk they drank, and then it tracked the growth of the children these mothers bore. Previous studies had suggested milk consumption during gestation results in taller babies but none of the studies examined milk’s role specifically. 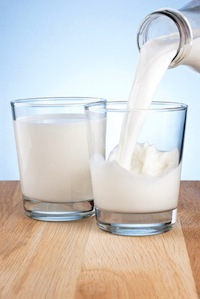 Of the 685 mothers in the Danish study, those who drank milk at a rate of more than five ounces every day had babies that were bigger than babies born to mothers who drank less milk. After 20 years, these same babies, now young adults, were an average of half an inch taller than their counterparts in the study born to mothers who drank less milk. In addition to being taller, these same offspring were found to have higher blood levels of an insulin-like growth factor -- IGF-1 -- by an average of 8 percent. IGF-1 is important for promoting bone growth, although the research team says the increased amount of IGF-1 20 years after birth is not enough of a difference to be considered statistically significant to the study’s findings. The findings do indicate a mother’s milk consumption during pregnancy “does increase weight and length at birth” and suggests the increased height continues until the child reaches physical maturity, according to Halldorsson. The women in the study who consumed more than five ounces of milk a day and gave birth to the bigger babies almost unanimously chose to drink low-fat milk. Some other factors taken into consideration were the mother’s age, body mass index (BMI), and height. The multinational team of researchers includes members from various institutions in Denmark as well as Iceland and the Harvard School of Public Health’s Department of Nutrition in Boston, Massachusetts. Source: T I Halldorsson, et al. "Maternal Milk Consumption, Birth Size and Adult Height of Offspring: A Prospective Cohort Study with 20 Years of Follow-Up." European Journal of Clinical Nutrition (EJCN). 4 Sept 2013. Web. 30 Sept 2013.